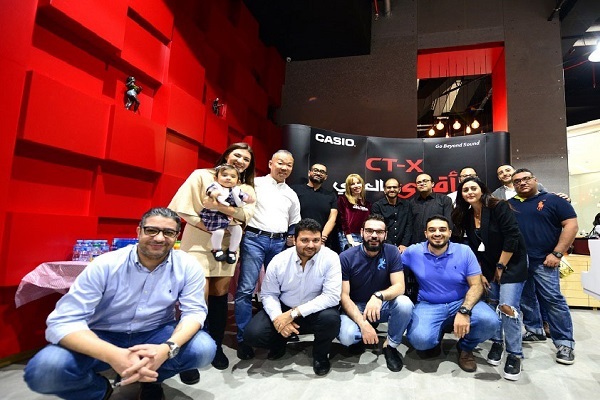 Casio Middle East has launched its recently improved AT-3 and brand-new CT-X series keyboards specifically designed for the Arab market, marking its formal entry to the growing Arab electronic musical instrument industry. The formal unveiling of the two products took place at the Music Chamber, the one-stop music experience showroom and academy, at The Mall, Jumeirah in Dubai. In conjunction with the launch was the rolling out of Casio Middle East’s Arabic YouTube channel https://www.youtube.com/channel/UC3X54vbHnuNvMGZ7hXuiEEw to serve as its official platform in the hugely popular video-sharing website. The channel will broadcast footage of its latest top-of-the-line musical instruments and their features, as well as easy-to-follow tutorial videos for beginners and professionals alike in keeping with the company’s commitment to help nurture music geniuses in the region. The CT-X series features a right mix of unique Western, Oriental and Gulf sources capable of playing different styles of music such as R&B, Rock, Jazz, Saidi, Maksoum and Katakofti, while the upgraded version of the competitively priced AT-3 series offers a new set of Oriental rhythms with a professional arranger to support new beginners and a veteran musician performing a one-man show. Both strong Oriental keyboard products are integrated with pre-set Arab music and oriental rhythms to appeal to local and regional artists. Koji Naka, the managing director, Casio Middle East, said: "The two new products launched is a boost to our initiative to highlight the role of music, a universal language, in bringing people together regardless of their nationalities and cultural backgrounds." "In the Middle East, we aim to attract Arab musicians, listeners, and fans by offering them a product that fits their needs. On the business side, the unveiling provided us with an opportunity to show our strong interest and desire to capture a large portion of the Arab market amid the rising opportunities in the electronic musical instrument industry here," he stated. Live performances by Mohammad Salah (Keyboard), Michael (Digital Piano), Rami (Oud), Valerie (Piano), Beshoy (Nay) and Hani (Violin) dominated the launch event attended by key Casio and Music Chamber executives. Salah, a professional Iraqi keyboardist, said the improved AT-3 is the best keyboard in today's musical instruments market for learning or playing Oriental music. It is loaded with advanced features and options allowing users to create their very own music, rhythms and tones, coupled with high quality materials and one of a kind output quality that makes it unique among its competitors, he explained. to serve as its official platform in the hugely popular video-sharing website.